On Tone 13 we Ascend to Higher Ground. Higher Consciousness changes the way we see things. We can feel a shift of our Identity as we see our Self from a higher perspective. The Earth/CABAN trecena has led us to see that we are One with Mother Earth in both Spirit and physicality. Every element of Earth holds a meaning and purpose for the Whole. From the micro to the macro, there is evidence of a Divine Design. Offering/MULUC elevates our Consciousness to Human’s place in the whole of creation. Earth was the Creator’s gift to Human. Human is the Creator’s Offering to Earth, Given the Divine Consciousness to Know and Marvel at her Beauty and Love. We are the hearts, minds, and spirits through which God could experience the Creation. We were placed in the center of our own universe. Every Human exists in their own Center of the Beauty of Mother Earth. The Beauty of the Creator’s Love is offered equally to every Human. No matter where we are, the Earth calls us to a Response of Love. Earth/CABAN helped us to see that Beauty is the physical manifestation of the Creator’s Love, and made of Earth, so is Human. Human’s Love is Divine by the Free Will to Choose it. Earth/CABAN paved the way for a new Human experience of life on Mother Earth. We were guided to see that when we Love Back, we are One in the Light that Earth projects to Infinity. The Number 13 represents the Creator’s Sacred Gift of Communion, and the Promise to Intervene in the Journey to our Divine Destiny of Knowing the Creator’s Love. What would be the point of a creation of Beauty if there was no one to See or Acknowledge the Whole of it? Human was placed it the center of it. In the beginning, we lived close to Mother Earth. The indigenous peoples of the world are the last outposts of those raised in an Intention to walk a Path of Beauty, an Intention to be One with the Beauty, Life, and Consciousness in every thing. Those the world esteems as the most Intelligent and Knowledgeable have drawn Human farther and farther away from the Intimate experience of Earth we once knew. We once walked only on Earth. Now we navigate upon a man-made construction of Earth that attempts to level out a faster path from here to there. We’re separated even from the Earth’s natural formation that mirrors our own ups and downs. And, what good purpose led to the design of a Gregorian calendar that disassociated Human from even the rhythm and patterns of Light that would naturally draw our Consciousness to an Experience of synchronicity? What was the point of separating us from the shared experience of Time with Mother Earth? Her movements were calculated to share Beginnings and Endings. Earth was designed to support Human’s experience of Duality, so we could experience our Transformation by cycles that clearly reflect our “Befores” and “Afters.” Confusion is still employed by the lower consciousness of Human as a means to divide and conquer for the intentions of worldly gain. Human becomes the Savior through an Intention to Discern the Divine Truth for our Self. The Cherokee Day Sign, the River, calls us to be One in the Flow of Divine Spirit. We are called to see Time in its Whole as Measured Experiences that would naturally draw us toward the Consciousness of our own Beauty in Multiplying the Creator’s Love to Abundance. 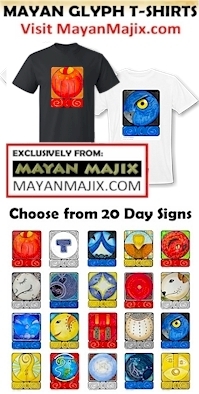 The Maya are referred to as the Lords of Time. They saw the accurate measure of Time important enough to carve in stone, that would remain as a measure of the “Time created for every Divine Purpose.” Nothing was overlooked in the Creator’s Design. We were given the way to measure Time by the Stars. Just like a clock, the orbits of heavenly bodies moving around the Sun is formed of wheels within wheels. Our Time is reset to zero with every Rising Sun that synchronizes our inner biological clock to a day, a single unit of experience. Even that has been adjusted on the clock by Daylight Savings. Thank God that no adjustment of Time can separate us from our experience of the Dawn. Mother Earth is the center of our dynamic experience that allows us to see ALL time from a “future” to a “past” and “present.” In her Movement, Mother Earth allows us to discern and record a lifetime of experience. Everything wants to be Seen and Acknowledged. The Highest Vision that Human could acknowledge in itself is that, like Mother Earth, we exchange the Light of Love through the Beauty we create. CABAN helps us to remember how Beauty affects us. Beauty calls to us and stops us in our tracks. In its message of Unconditional Love, we want nothing more than to See and Acknowledge it. Earth/CABAN helped us see that our Spirits are Nourished by just being present in the moment. Earth/CABAN guided us to see that our Relationship with Mother Earth was intended as a Call to Love. Human was intended to be influenced and evolve through the dynamic Beauty of Earth. Mother Earth is the Creator’s work of Art. She’s more awesome than any photograph or moving image of a video. She is a Living, Breathing, Loving, Moving Creation of Beauty. Just as she moves her Love through the Universe, so we are called to Live, Breath, Love, and Create Beauty wherever we go. I imagine the way the Earth looks from the farther reaches of the Universe. She is recognizable by the Potential for Life she holds. Her water projects her most recognizable color of Blue. Her most predominant vision from afar is the Water than holds the Ether of the Human Spirit. Human is One with the Light she shines to Infinity. That same Light that goes on forever is generated by Human and Mother Earth as One Together. Seeing Beauty that is reflected from so far away, we can believe that so can our Love be experienced from far away. The Light of our Love extends beyond a single exchange in the moment. Together our Love can heal all the Hearts on Mother Earth as Human’s Creation of Beauty. Offering/MULUC shares the Intention to Pay Back and Pay Forward. Through a Sacred Offering paid back to the Creator, we are drawn into Atonement with the One Divine Mind of Consciousness. The Elders always said that when a Sacred Offering is made, what is given should reflect the value of what we expect to receive. The only thing that Human could possibly give as a worthy exchange for all the Love and Beauty we are given is to sacrifice our Whole Self. Only through an Offering of our Self in the Intention of Giving Back could we come close. We can accept in advance that it is an Intention we are unable to manifest by our own Power. Though, we can believe that in the Aspiration of our Highest Purpose for Being, the Creator will manifest the Dream for us through the help of Divine Intervention. The Earth/CABAN guided a trecena of the “Light” of incoming inspiration. Unseen within our self, the effort of Love and Creation have been happening within us. We dreamed of our Self raised to a Higher Consciousness of the Power of our Love, and our Power to Create Love by our own Intention. A Seed of our New Self has been Designed, Seen and Acknowledged for what it could be and how it would change our Human experience of Life on Earth. The Day of Ascension is a time of celebration. We stand at a new summit of Consciousness, opened to new Dreams of even Higher Horizons ahead. Today through a personal Offering we are Atoned with the Creator. Our Intentions are aligned with the Above. We’ve been prepared for a new journey through the “Dark.” We still haven’t gained all the wisdom we are capable to Know about the Love of Mother Earth. We are prepared for the next trecena of “Darkness” – the application of our Inspiration that will Complete our Understanding by the Wisdom of a personal Experience. We are prepared to enter the trecena of Dog/OC, the Day Sign that can elevate our Consciousness even Higher to the Unconditional Love that is central to the Creation. As the Dog will lead the application of Love that was Magnified by Mother Earth, we will experience our Own Manifestation of Beauty. The 9th uinal will complete our lesson of Creating Love, and Dog will guide us to the 10th uinal of Manifestation. The budding of new Life will be transformed into a new Blossoming of Spirit. We have so much to look forward to. We can expect new challenges of Love as we make our next climb of Spiritual Growth. Again, we can expect to reach our limit in failure. We can Offer our Self to the Darkness of the UnKnown that will prove again that we could never reach the end of all the Love there is to Know. As we celebrate a new beginning, may we see this as the Beauty of both our Darkness and our Light. MULUC is a symbol of the Moon and our Emotions. This is a day to honor our Emotions and the Emotions of others as the Language of the Heart. This is a day of Emotional Healing that can open our Hearts to an experience of the Creator’s Love. 13 Offering/MULUC brings the Healing of a Divine Discernment that speaks through our Heart. The Purpose of the Divine Feminine of Mother Earth is elevated by a Crowning Achievement. A Sovereign Creator could have easily placed a Divine Human directly on Earth, but instead, Earth was populated by ordinary Humans She would Transform into Saviors. Humans are the Ones created to carry out the Sacred Exchange that would Unite the Love of Heaven and Earth. To all my relations, I’m grateful for the tangible experiences of Love offered through Mother Earth… Love we can Know with all our Senses. May the Love we return be One in Mother Earth’s vibration of Love that we would ALL Know through our physical connection. May we see our Self as no less Divine. May we Dream of the Possibilities of Loving ALL the Time we are given to exist within her Beauty. As we look at the images of Mother Earth, her pattern of movement, and the Light she projects, may we Know that Human is also a creator of Light, and One in the Illumination of the Creator’s Love that shines from her to infinity. May we take on a new and Higher Aspiration of Love, sacrificing our Self to the next Human failure, so we can See, Experience, and Acknowledge an Even Higher Truth of the Creator’s Unconditional Love. May we Believe in the Power of Eternal Love to create a Miracle that every Human eye can see. May we Pay Back and Pay Forward the Love of Mother Earth, through a new Intention to See, Acknowledge, and Multiply the Beauty of her Love. I’m grateful for the endless Beauty of Mother Earth, so abundant like the Creator’s Love that the only way we would have Time to See and Acknowledge it all is through a promise of Eternity. 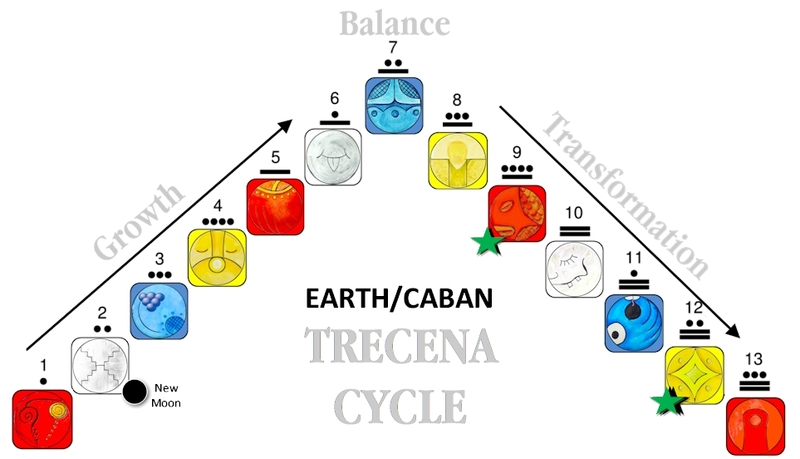 Visit the 13-Day Trecena Guide for daily aspects and events of the Earth/CABAN trecena. Galactic Tone 13: Ascension: Thirteen assists us to go to the next higher step, propels us to try something new or to try again. Thirteen energy takes us over the next mountain just to see what is there. Thirteen carries the last success to the newest effort. Thirteen is a number associated with the Ascended Masters, creation, expansion, and manifestation. Offering/MULUC: The sign of water. Ceremonially, Maya use water as an offering in baptisms and purifications, done to bring about a collective strength, adaptability and harmony. Fluid of the cosmos to fluids in the body, Muluc offers the energy to clear all karmic debts, personally, and on a mass level with fluid and grace. Muluc is also associated with the Moon and the emotional body. Water days are a good time to analyze your wishes and prayers and connect them to any rituals or practices you follow. Cherokee, The River/YUN’WI GUNNAHI’TA: The River is symbolized by The Milky Way, the Gihli’Utsun’stanun’yi “Where the Dog Ran” to gather the souls for Heaven. The River is the minion for Grandfather Moon. Long Man is the personification of the River stretching from the mountains to the lowlands, speaking to those who can understand. People of this sign find “sermons in the stones” and good in everything. These souls march to a different drummer, driven by inner volcanic forces. The Moon controls our fluid cycle, to clear and understand emotional issues. When you take this step to clear the emotional body, then you are ready for transformational energies at the next level. As humans, our actions are ruled by our emotions, the key is to understand the connection and honor the emotions.